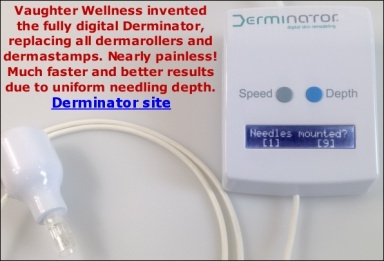 Dermarolling / Microneedling / Our Derminator® is finally for sale! Finally we announce the world's only fully digital dermaneedling device, the DERMINATOR. I'm announcing this months after we started selling, because only since recently we aren't constantly sold out. We invented, designed, prototyped and now manufacture this machine ourselves in Europe in our own factory, using our own employees! We sell it for ten times less than comparable professional-range machines used in clinics because we have a different business model: We think that everyone should be able to afford a clinic-grade dermaneedling machine and thus can afford to bring down the price because we're making these in large quantities. Electronic components, when bought a thousand identical parts at a time, are up to five times cheaper. This, and focusing on home users as well (high sales volume), not advertizing and no fancy packaging is how we can afford to charge only $170 instead of the $2000 that is customary for these type of machines, and then you still won't get the sophistication and safety of the Derminator. There is nothing in the professional dermaneedling world available like this. Hundreds of clinics have already purchased one. Chances are that next time you go for that 600 dollar needling appointment, they'll be using this machine! The name reminds of The Terminator movie series and that's appropriate because contrary to the Chinese pen-type devices that cause microtearing because they are too weak due to the fact that they are based on permanent-makeup machines, the Derminator is very powerful and needles to the advertised depth and does this so fast that there is no microtearing. And just like the Terminator is an intelligent machine that came from the future to use force, the Derminator is a futuristic, computer-controlled machine that uses sophisticated technology and physical force to greatly improve skin problems such as stretch marks and acne scars. This machine represents a paradigm-shift. It is so cheap that it will replace manual dermaneedling, also because it's indestructible* and can be re-sold years later. Needle cartridges are only 3 and 4 dollars (for the single needle resp. the 9-needle cartridge). No shipping cost to nearly all addresses worldwide. The machine has digitally set needling depth, controlled by a microprocessor and a depth sensor. Make sure to watch the video where we show that our machine does not cause microtearing and competing devices do! Dermarolling / Microneedling / Re: Would like to try out Dermarolling WITH SUCTIONING! I followed through with your advice: stamping initially every 3 weeks, but changed it to 4 weeks (due to work), but when I did my monthly dermarolls & stamping, with the single needles too, they were quite aggressive. As you can see from my initial picture, my scar is quite deep, infact, you can see the deep "crevice" with the help of shadows. I took another picture by the 4th month, whereby you can tell that the edges have slightly smoothed out and the depth of the scar isn't as full as it once was. I was quite happy with this result to be honest, but I persevered because I remembered a comment you had made that sometimes building collagen "reaches its limit" in some individuals, but i continued. The latest picture is of me at the 15month mark of my monthly and weekly dermarolling and single needling sessions. I would actually say, that this is more of a "12month update" because the scar has been like this for a number of months, I just didn't get time to take pictures or take time to write to Sarah, due to work and family/relationship commitments, until now. As you compare my initial photo, with my latest one you can definitely see changes. The edges have smoothed out significantly, the depth of the scar has lessened. The discolouration that you can see, is just of dry skin and will peel off. Anyway Sarah, I'd like to thankyou from the bottom of my heart. Sure my scar hasn't gone away completely BUT it has come to a point where I can face the world without most people noticing it (besides me confiding about it to those closest to me). I will continue to carry on with my treatment regardless, for years to come, because I am hoping that my scar will "build up" even more than it is now (I often see a slight dent when I turn my head to the side and catch the shadow, you can tell I have a slight scar then). I don't know what my login info is, I used to go by the name Anna on owndoc.com so I haven't been able to log in to write an update in quite a while. I wanted to let you know that my acne scars have improved tremendously, as well as my chicken pox ones although I've seen greater improvement with my acne scarring. If I had to say percentage wise I would say my acne scars have improved by an impressive 80%, and my chicken pox ones by 40%. I am constantly mistaken for someone in their 20's and that's a nice plus For the first time in a loooong time I am comfortable enough to wear my hair up and away from my face, you have literally CHANGED MY LIFE and I will forever be grateful to you. I will continue to be a loyal customer and I have told many friends and family members about your website. Right now I am continuing with the Dermarolling mostly for maintaining firmness, I'm almost 34 that's the stage my skin is going through now, and to smooth out whatever small acne scarring I have left. On another note, your copper peptide serum is a miracle, I had a really bad breakout that scabbed over and almost always results in an indentation after it heals, I was applying the copper peptide serum on it two three times a day and guess what? It healed over completely smooth! No scar or indentation AT ALL! This has happened on more than one occasion, I wanted to let you know that, I can't believe it! I will also be rolling my stretch marks from two pregnancies with your 80 needle derma stamp, I'm excited to see the progress on that and will most definitely keep you posted. Dermarolling / Microneedling / Re: Benefit to needling newer scar? Yes, it is safe to start microneedling. You can start about 6-8 weeks after the scar was formed. As soon as the scar is flat, stop doing the pressure massage. For thin scars, buy our 1.5 mm dermastamp with 12 needles and stamp the scar very densely every three weeks. A scar will never disappear but stamping will smoothe out the texture and slightly improve the color. Scars that are not yet fully mature tend to improve more than fully matured scars but it is not always the case. The dermaroller head is rolled over the skin, whereas a dermastamp does not roll and the needles are "stamped" into the skin through manual pressure. A dermastamp is useful for more targeted and intensive treatment such as for individual acne scars, surgical- and other scars, stretch marks, individual wrinkles, individual hyper- or hypopigmented spots etc. A dermaroller is suitable for the overall treatment of larger areas such as lost elasticity of the face, neck, décolleté and other areas, for enhancing the penetration of skin- or hair products, for the general improvement of skin texture etc. Often a combination of the two is very useful, such as stamping individual acne scars and then rolling the entire area, stamping stretch marks and then rolling the entire area, stamping individual wrinkles and then rolling the entire face etc. Subject: What do I need? I think at this point I have read almost everything on your wonderful site, but I’m still a bit confused. I’m 57 and would like to treat deep wrinkles on my face and neck. Up ‘til now I have used rollers up to 1.5mm without any blood, just some redness. Should I be needling some areas, then stamping them and other areas, then dermarolling? And if so, which size tool should I be using for each, and then how often. Yours is the most knowledgeable, comprehensive and user-friendly site I’ve ever seen. I can already see that there is much I have been doing incorrectly. If you could please give me your best guess, I will purchase the products immediately and begin a new and improved routine. PS . With all my heart, I appreciate any help you can give me, and if you can, and desire to, post this question and your answer on your website, please do. I recommend a regular 1 mm dermaroller. Some of our customers prefer a 0.5 mm dermastamp. When you roll/stamp around the eyes, pull/stretch your skin away from the eye with your one hand and roll/stamp it with the other. -For the so called 11's (the two lines between the eyebrows) - our single needles are the best. Needle the lines every three weeks. -For the wrinkles around the lips, buy a 1.5 mm dermastamp with 35 needles. This area is very sensitive and you may need a numbing cream. Buy a topical numbing cream in the pharmacy. It is called EMLA or it is a cream containing 5% Lidocaine. Stamp the wrinkles every three weeks. Buy our Infadolan ointment and apply a little after microneedling until the treated area heals. You can also apply a little Infadolan daily around your eyes and on top of your hands. Consider buying our vit. C.
Do not buy Tretinoin cream unless you have hyperpigmentaion or sun damaged skin. The copper peptides serum is useful for aging skin but it is not necessary for getting results with microneedling. When you get experienced with dermarolling and when your 1 mm dermaroller get eventually blunt, you can even go for size 1.5 mm. A regular 1 mm dermaroller. Use the same 1 mm dermaroller also on your entire face in addition to the above suggested treatments. In our experience, a dermastamp or a combination of a dermastamp and dermaroller is more effective for acne scars than a dermaroller alone. You should definitely add the dermastamp and during the same session, first stamp the scars with a 1.5 mm dermastamp and then roll the entire area. For your cyst scarring, use a 1.5 mm dermastamp every 3-4 weeks. What you can try is applying Tretinoin cream (A-Ret) on these scars right after stamping. It may help softening the scar tissue. I do not normally recommend applying Tretinoin right after microneeding but is some special cases (any scars or stretch marks with tough scar tissue) i do recommend it. Concerning your oils, keep the skin moisturized after microneedling until it heals. For the rest, if you feel your skin "likes" the oils, apply them as you suggested. Infadolan is very oily so I do not think it needs oils in addition to that. Your posting is off-topic on this forum. You posted photos of dermarollers that are not ours and which we tested as inferior, especially the one that doesn't have needles but stamped knives. Dermarolling / Microneedling / Re: Not sure where to start?? Hey Sarah this is my 4 month pic update.. 5 sessions so far... I am going to start the single needling next week! Can't wait ! This pic is taken with iPhone camera in natural light ... can't believe the improvement so far!